September 4, 2012 -- Somyot Prueksakasemsuk is to appear again on September 19 to hear the Criminal Court announce the date of the verdict of Somyot's criminal trial. At the same time, it will await the decision of the Constitutional Court on the request forwarded by the Criminal Court of the Constitutional Court’s verdict as to whether or not the lèse majesté law is unconstitutional in response to a petition by him and his lawyers. Somyot, however, speculates that the decision of the Constitution Court will not be delivered on that day and the verdict in on his specific case will be further postponed until the constitutional verdict is reached. Hence, we are again calling for your international solidarity to continue sending letters to the Thailand authorities in order that Somyot can be released soon. We need to ensure at least that Somyot be released on bail while he is waiting the verdict. Patchanee Kumnak, program coordinator, Thai Labour Campaign. This letter will be submit by the Thai Labour Campaign and other organisations in Thailand to the Thailand authorities before the September 19, 2012. We are writing to you in connection with the continued detention of Somyot Prueksakasemsuk, whose case will be heard again on September 19, 2012, and who can face the maximum penalty of 30 years’ imprisonment. He has been in pre-trial detention for more than a year since his arrest by officials from the Department of Special Investigation in April 2011. We respectfully remind you that the United Nations Declaration on the Right and Responsibility of Individuals, Groups and Organs of Society to Promote and Protect Universally Recognized Human Rights and Fundamental Freedoms, adopted by consensus by the UN General Assembly on December 9, 1998, recognises the legitimacy of the activities of human rights defenders, their right to freedom of association and calls on states to ensure that they can carry out their activities without fear of reprisals. We ask you to ensure that Somyot Prueksakasemsuk is released. Failing his immediate and unconditional release, we ask that Somyot Prueksakasemsuk be granted his right to bail, in accordance with fair trial standards under domestic and international law. Human rights defenders in Thailand, especially those working on freedom of expression, must be able to carry out their legitimate human rights activities without fear of reprisals and free of all restrictions, including judicial harassment. On September 20, 1961. Somyot Pruksakasemsuk was born into a Chinese-Thai family with altogether seven siblings. His keen interest in politics was noted when he was young. In his junior high school student shorts, he tagged along his older brother to join the demonstrations during the October 14, 1976, uprising for democracy. It planted a seed of democracy in him keeping his yearning for social justice always alight. During the October 6 uprising in 1979, three years later, still a secondary school student at Debsirin, he participated in political activities in full scale with his friends from technical colleges. After completing his education at Debsirin, he went to Ramkhamhaeng University. In 1981, he started his student activism with the Ramkhamhaeng Student Group for Labour Issue Study. An avid activist while at Ramkhamhaeng, he dedicated himself to fighting for human rights and justice. He joined the Seree Tham Group and organised activities for workers in factories and grassroots communities. It was aimed at engendering awareness on civilian rights and liberties and democracy along. He was also writing prolifically then. He was one of the earlier unionists in Thailand trying to unionise workers, training them on legal knowledge, organising camp activities for the workers, organising public demonstrations to oppose dictatorial rule, etc. He was very active in Phra Pra Daeng industrial zones in Samut Prakan covering Thai Garment Labour Union, Textile Promotion Labour Union, Thai Kriang Labour Union, Pipat Labour Relations Union, Century Labour Union, Metro Labour Union, most of which were involved with textile, garment, steel and metal industries. In 1984, Somyot joined the Union for Civil Liberties (UCL) as a staff member and volunteer to promote labour rights. In the same year, UCL focused on Om Noi and Om Yai as its main project sites and embarked on organising training on labour law, setting up labour clinics, supporting association and unionisation among the workers, since workers in these areas got lower pay and lesser benefits than other workers. In 1986, he joined the Young Christian Workers (YCW) as a full-time staff member. The NGO advocated the organisation of young workers. Somyot got to learn how the workers lived their lives, and planned together with them for schemes to better their livelihood. An NGO with international networks in Asia, Europe and America, YCW had members from factories in Phra Pra Daeng and Bang Pli, Samut Prakan and Ransit, Pathumthani. As coordinator and staff member, Somyot was instrumental in the campaigns for social security law promoting the organisation and education among union members. Train and raise awareness of workers on their rights. Promote the organisation of workers to increase their bargaining power and to effectively demand improvement of working condition to enhance their quality of life. Promote the roles and organisation of women workers and women leaderships. Advocate amendments to the labour law to better protect labour rights and benefits and to help protect their rights when their rights are disrespected or violated. Train and provide other educational activities to help workers be aware of their rights. Promote organisation among the workers so that they can use it to increase their leverage to demand the improvement of working condition and enhance their quality of life. For more than a decade at CLIST, Somyot fought together with workers and labour movements and their many demands have been met. For example, the enactment of Social Security Act, 90 day-maternity leave, an increase of child support allowances, support and solidarity given to particular labour movements, such as the Kader workers, Thai-Belgium workers, Eden Group workers, etc., until they could get severance pay higher than the amount prescribed by law. In addition, CLIST under Somyot’s management also gave fervent support to help women workers form the Women Workers for Freedom Group, the formation of the Chemical Workers Unions Alliance (CWUA) and the Alliance of Democratic Trade Unions (ADTU). Due to budget problem, CLIST had to terminate all activities in May 2007 after 16 years (1991-2007) under the directorship of Somyot. His inspiration to work on labour issue stems from his experience working in a Volvo car factory. He chose to work there for a short stint in order to learn how difficult the life of a worker was and later produced a manual on how the workers can propose their demands. His easy-to-read manual also helps the workers understand how they are put under exploitative environment and how the economic rent has been stolen from them. With the closure of CLIST, Somyot turned to journalism, which he has been keen on and became editor of Siam Parithat (Siam Review). After the coup on September 19, 2006, Somyot joined the movement to oppose the Council for Democratic Reform (CDR), the coup maker. He joined the National United Front of Democracy Against Dictatorship, which has later developed into the United Front for Democracy Against Dictatorship (UDD) and later became part of the second batch of its core members. While mobilising against the September 19 coup, Somyot formed the 24th of June for Democracy Group in early June 2007, during the commemoration of the 75th anniversary of the establishment of democracy in Thailand. The 24th of June for Democracy Group aims to (1) disseminate information and instil the spirit of democracy in general public, (2) mobilise people from all walks of life to against any form of dictatorship, (3) collaborate with civic organisations inside and outside the country to promote democratic society for justice, rights, liberties and equality in society. Although Somyot was part of the second batch of the core members of UDD, in May 2007 he quit from the role and ceased to be a UDD leader and has not been involved with any activity by UDD. On May 24, 2010, Somyot was arrested on a warrant. He was held in custody together with assistant professor Suthachai Yimprasert, from the faculty of arts at Chulalongkorn University. They were arrested as alleged offenders under Section 11(1) of the Emergency Decree on Government Administration in States of Emergency B.E. 2548 (2005), which allows the arrest and detention of "a person suspected of having a role in causing the emergency situation, or being an instigator, making the propagation, a supporter of such act or concealing relevant information relating to the act which caused the State of Emergency”. When he was arrested, he was editor of the Voice of the Downtrodden. He wanted to make the magazine a mouthpiece for the lower class, the people whose voices are not heard in society, so that they can convey their feeling and needs. His professional journalism has always been steered toward the candid portrayal political, economic and social issues. 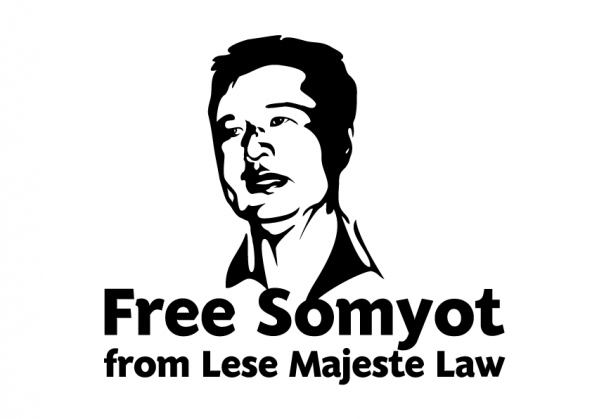 On June 12, 2010, the court dismissed the request by Center for Resolution of Emergency Situation (CRES) to extend the detention of Somyot for the third time claiming that there was no necessity to hold him in custody as the unrest has been put out and therefore he should be released. He was released after being in detention for 19 days. Somyot was charged under draconian lese majeste law after he was arrested and imprisoned without rights to bail on April 30, 2011. After being detained for 84 days, he was brought to court and charged on the August 25, 2011.